In other words, the Alternative Formative Assessment movement is essential in moving away from the mass labelling of students with letter grades that is currently, and has long been the practice in schools. Instead, we need to develop cultures of reflection and feedback in schools that empower students to take ownership of their own learning. 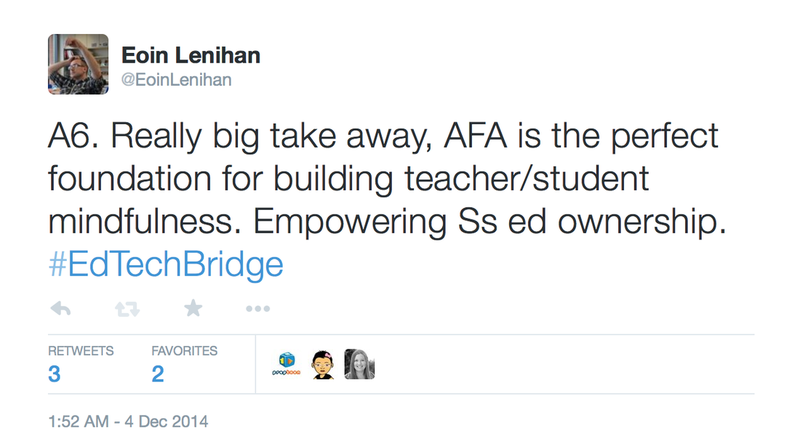 First, what does traditional Formative Assessment look like? From my observations and experience in the classroom, it is most common to see graded worksheets, homework, quizzes and essay work used as indicators of student progress. And “progress” rarely coincides with individual student understanding in relation to learning outcomes, rather it usually means movement towards and preparation for the end of Unit Summative Assessment. It is a process of checks and labelling. But does it work? 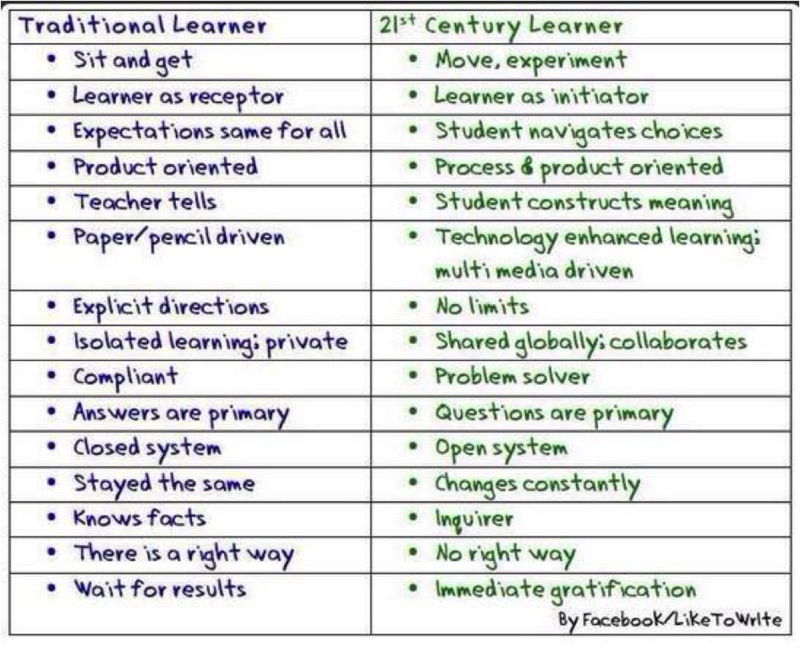 If educators hope to produce the 21st Century learners outlined in the chart below, the answer is a resolute no. 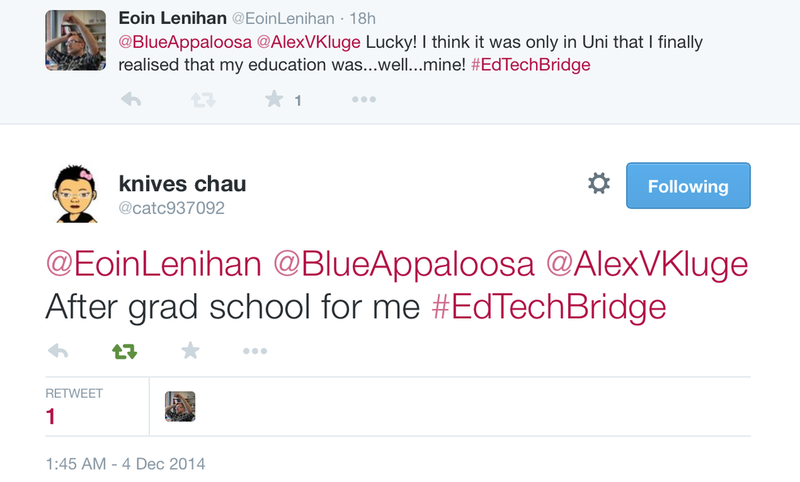 One of the most startling revelations from Wednesday’s #EdTechBridge discussion was the feeling among participating educators from different nations and US States who agreed that this traditional process of assessment had utterly failed them. Formative Assessment was simply a means of preparing for the “big one”, the Summative Assessment that would determine success or failure in a given Unit. They suffered in a system that keeps students so busy cramming for quizzes and tests that they have no time to take ownership of their learning. The current relationship between Formative and Summative Assessment reduces education to a memory game and instead of medals, those students who succeed are given letters and in the greater “progression” of education toward University entrance exams, it becomes impossible for students to see any other purpose in their daily school activities. For many educators, then, reform of Formative Assessment is crucial, hence the rise of the Alternative Formative Assessment movement. Though it is in its infancy, it shares common ground with the Teachers Throwing out Grades #TTOG movement currently being inspired by @markbarnes19 and findings from the Evidence-Based Teaching studies of John Hattie and Robert Marzano. What unites them all is a belief in the importance of student voice and choice in the Formative Assessment process and meaningful teacher feedback. Were educators to step away from traditional Formative Assessment — and the Alternative Formative Assessment movement and #TTOG would do away completely with grading — how instead could students demonstrate understanding? The answer is in becoming reflective educators and learners. Here are three examples of how this could look in practice taken from my own teaching experience. 1.As a Middle School Humanities teacher at the International School of Augsburg, I collaborated with a Lower School Colleague on @voicethread. As a Formative Assessment, students were asked to prepare a short oral presentation on the research phase of their Unit of Inquiry. Students from our class acted as “critical friends” leaving feedback for the younger students. The @voicethread was also open to parents who could make suggestions for the research process and for the final artefact. This method facilitates authentic reflection, gives the students the benefit of multiple perspectives and critiques and also provides an audience for their work. @voicethread promotes reflection, feedback and transparency. 2.At the International School of Augsburg, Grade 7 students partook in the Medieval Fair each year. Students were given guardianship of a Medieval Fair Pack, which, combined with written essays, made up the portfolio element of their Fair Day presentation. The pack was structured to act as a means of reflecting upon their research and planning journey and students were assigned a task each week on a pass/fail basis. For example; on a presentation board-shaped sheet, students were asked to envisage their final product and draw it in detail. On the final board, students presented this illustration and used mind-mapping software to reflect upon how and why the end product differed from their original sketched conception. Making this evolution of the project visible allowed students to share their research process with visitors. Throughout the project, Formative Assessment focused on developing organisational, critical-thinking, reflective, self- and peer-feedback skills. 3.In my seminars on Internationally-Minded Education at the University of Augsburg, one classroom wall always becomes a “Process Wall” where students are engaged in @ProjectZeroHGSE Visible Thinking Routines. As a project develops, students are asked to routinely make their thinking about a given topic visible on the wall and they are tasked to return to and reflect upon how their thinking has changed over time. Students are asked to complete written and oral reflections on the process. In the Second Level classroom, I would encourage photographic recording of each Unit of Inquiry Process Wall to make a “Thinking Diary” for students to review and present all of their thinking at the end of the year as part of a digital portfolio. In this way, a school can develop a culture of Visible Thinking. For more practical examples of how to develop Alternative Formative Assessment to support your students in becoming 21st Century learners, please view and contribute to #EdTechBridge’s shared resource document here, or join in the conversation with @mr_isaacs every Wednesday night at Midnight (GMT).